Craig Mackinlay MP has won a reprieve for UK pleasure boat owners who, until now, were at risk of being fined by the Belgian authorities for carrying ‘Red Diesel’ in their fuel tanks until the EU Committee on Excise Duty meets to hopefully address this matter on 18 September 2017. 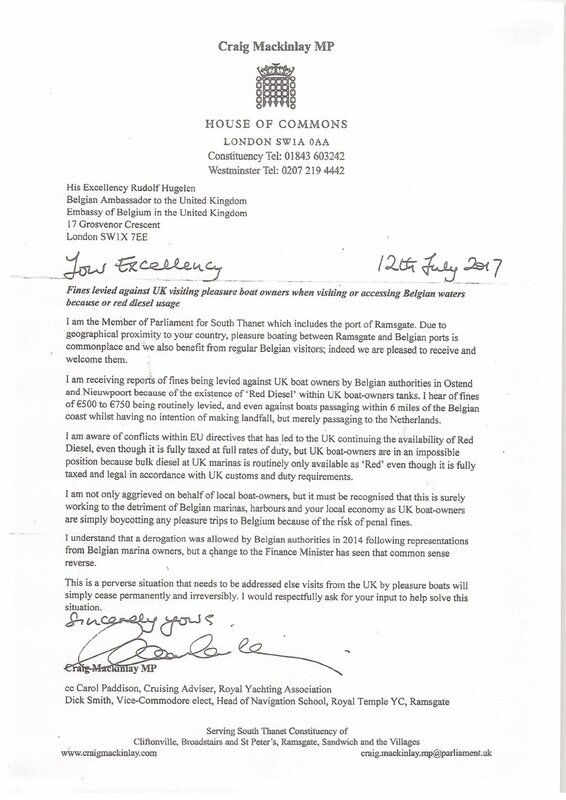 The Belgian Ambassador to the UK, Rudolf Hugelen, issued the assurance in a letter to the South Thanet MP after Craig wrote to the Embassy after learning that penalties were being issued by the Belgians on yachtsmen who fill their tanks in British marinas before departing for ports in Belgium or Holland. Bulk diesel at UK marinas is routinely only available as ‘Red’ even though it is fully taxed and legal in accordance with UK customs and duty requirements. A derogation was allowed by Belgian authorities in 2014 following representations from Belgian marina owners, but a change to the Finance Minister has seen that common sense reverse. Such a derogation has routinely existed for UK pleasure boats visiting France, the Netherlands and Southern Ireland. “I am very grateful to His Excellency Rudolf Hugelen, the Belgian Ambassador, for his prompt response and for helpfully assuring me that UK pleasure boat owners will not be fined for carrying ‘Red Diesel’ or traces of ‘Red Diesel’ in their fuel tanks whilst in Belgian waters until the EU Committee on Excise Duty meets on 18 September 2017. “As the Ambassador duly concedes, France and Holland have both shown flexibility towards British pleasure crafts navigating with ‘Red Diesel’ as they know it is fully taxed and legal in accordance with UK customs and duty requirements. “So I am pleased that the Belgians are now applying common sense to the matter once again, at least until such time as the relevant EU Committee makes a judgement on its future application. “These fines are also working to the detriment of Belgian marinas and harbours as UK boat owners are now opting not to call into Belgian ports.